Documentary | The greatest WordPress.com site in all the land! The Kiwi crew is now in the final stages of making our film. Everyone is working very hard to get the documentary to be ready for submission on Wednesday, April 10th. Syd and Jojo have spent any time they can after school making the final touches to the film. Nell has also given up numerous hours of her free time to assist in the final edits. The struggle with music trivs has continued because we have decided to dedicate all of our focus on our documentary, leaving no space for trivia. We are going to vote on our movie poster soon…the documentary is looking great and everyone should be getting excited to watch! This past week, the Kiwi crew has just completely finished getting the town shots of Walpole, Norwood, and also the final interviews. We are about half way through the editing process and everyones been working hard to get it done by the due date of April 10th. In the beginning of the week, we had to reshoot John White in order to get him in better focus which ended up being very successful. During the past couple weeks, Kiwis director Sydney King has been putting in countless hours working on the documentary. She has been staying after school many days of the week along with working on it all through class. Another person who has contributed in a significant way is one of our editors Lena Ford. She has had many great ideas that she has put in the doc and has also spent many class periods working on it. Well Kiwi has certainly been struggling with music-trivs and is currently in dead last. We are hoping for a comeback and to make it into the top 11 teams. We missed one of our directors in the beginning of the week due to jury duty (Judge Jojo). But thankfully, we have her back and she is ready to go and work on this terrific doc. So this week kiwi is putting in a lot of effort. We are currently in the production process. Our crew has finished interviewing the hockey players and coaches. We have finally started to put together the documentary in a sequence. We have watched the amazing documentary “Undefeated” and are using some of their film techniques to help guide our film. In “Undefeated”, their use of music to emphasize the drama in each scene really stood out to us and we would love to incorporate that into our documentary. One setback we had was that we wanted to have our film be evenly sided between Norwood and Walpole. Unfortunately the Norwood players and coaches have been difficult to get in contact with and we were unable to interview them as much as we have interviewed the Walpole team. As director, I have noticed that Nell and Lena have done an amazing job in starting the editing process. Staying after with them, I can see how much they put into this documentary and I am very thankful for their work. Also, Scott Marcum did a great job filming the towns. The shots of the specific areas in the towns are a very crucial part in our film and he really did a great job. This was also a very hard job because he had to get the shots while we were driving which is hard to do. So we have a new member in our crew, Mr. Brendan Sullivan. After getting the boot from his previous crew (Wombat), he had to prove to us that he could stay on our crew. After helping us schedule interviews and staring in multiple interviews, Brendan showed us that he could be an important addition to our crew. The hockey team has invited Jojo, Bridget, and myself to attend their end of the season banquet. We are very excited and appreciate everything that this team has done to help make our documentary a success. We know how hard it is to have us around during tough times and that the boys were probably ready to kill us but we are so thankful to them for letting us follow them to the playoffs. Lena Ford has really stepped up this week, taking her role as editor very seriously. She has organized our clips into bins within bins etc. We had a little scare when we realized that we had been doing some of the editing on the “Copy” version of our documentary, but Allan cleared that all up for us. While Lena was organizing some of the clips, we came across the ones of the players getting their pre-tournament haircuts and there were many laughs with that. This week we also were all assigned to watch the award winning documentary, “Undefeated”. The documentary is about a struggling inner city football program with a phenomenal coach. I highly recommend this documentary, as it is very well done and also very emotional and entertaining. We are going to steal some of their ideas as well. So that’s pretty much all for Kiwi as of now. Peace out. As of today we still have to interview the players about their recent play-off game. Once we get that footage we can start the post-production process. We got a lot of awesome footage from the very intense play-off game. One minor set-back was that the MIAA would not allow the filmers to be up against the boards because they would be in the way of the fans, so at times there were things in the way of our filming. We also had a minor problem with coach Dowd’s mic. During some parts of the game he forgot to un-mute the mic, but it turned out to be no big deal. During the play-off game, we had Lena and Nell film the game from up in the stands. Sydney, Bridget, and I (Joanna) were filming the game from down below. We have all done a great job staying involved and we all step up when it is needed. One thing that really gets the intense is the fact that at the end of the game, it was tied 2-2. The over-time is really going to bring a lot of suspense to the documentary. So far, in music-trivs, we are in last place. Kiwis are originally found in Northern China (in the Yangtze River Valley) Kiwis, even though are large and have an outer skin with fuzz, are actually berries. They grow like grapes with shrubs on vines. Kiwis are an extremely healthy fruit, they are filled with vitamin-C(263%). Kiwis can help improve damaged DNA. It can also help improve the functions of your immune system! One bad thing about kiwis is that a large portion of them are sugars(16g). MAKE SURE TO EAT YOUR KIWI!!!! I hope you enjoyed those fun facts of the week stay tuned for next weeks blog from Nell!! So it has been a really long time since we blogged, and we apologize. Since we’ve been gone a lot has happened. Blizzard Nemo took over New England and the big Walpole/Norwood hockey was postponed from Saturday the 9th, to Sunday the 10th. So we got to the hockey game on Sunday nice and early and got the pre game speech from Dowd (who was mic’d up) and some interior shots. Unfortunately, for us, as well as for the team, the Walpole Boys Hockey team lost to Norwood 5-1 on Senior Night. Not the ending we had all hoped for. But now we have decided to take our documentary in another direction, we are going to focus on the playoffs. The hockey program has not won a playoff game in six years and we all strongly believe that this years team can be the ones to change that. The Walpole/Norwood game was just a minor setback in a bigger goal. So we have a lottttttt of work to do to in order to make this documentary come together. We will write more often!! This week is mid-years so it’s a busy week, but also allows for good time to work on our documentary. 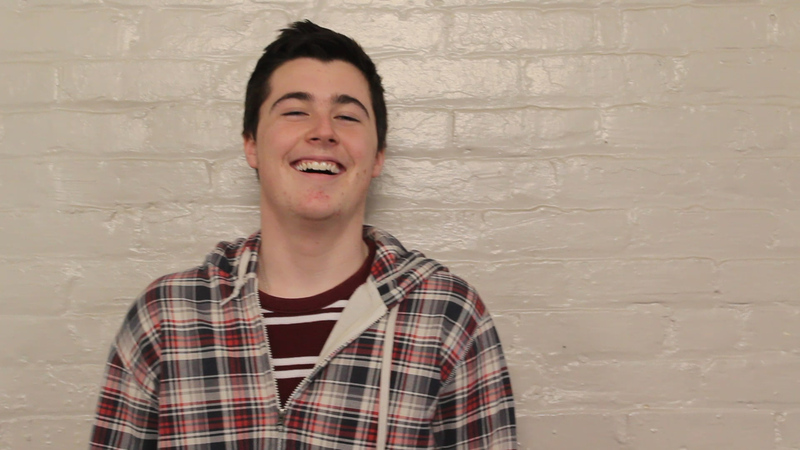 On Tuesday, Helena and I (Nell), interviewed Walpole Hockey alumni, Matt Baker. He shared with us some great memories and stories from the rivalry he experienced back in the day when he played. It’s funny how not much has changed; the intensity, the atmosphere, the emotions. That’s what makes this documentary so great because the rivalry is just so intense. Helena and I are here editing his interview and scheduling upcoming events that the Kiwi crew are going to document. We are going to get the Dedham game before our Senior night game against Walpole. ‘ sure Coach Dowd will have some great things to share with the team and it will sure to help allude to the hype of the rivalry that will take place that Saturday in the Walpole/Norwood home game. Thats all for now.